Many of us have ancestors who put down roots in the city. Whether they opened their own businesses, or worked for someone else, there were opportunities in urban centers not available in more remote areas. Also, people who lived in cities tended to be more mobile; they may not move as far, but they seem to move more often. 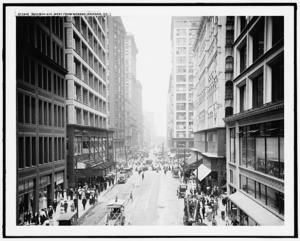 Luckily for genealogists, there are several resources you can use specifically for urban research. In general, census records provide a snapshot of a family at a given time and can provide valuable clues for further research. But beyond the main records, there are manufacturing and industry schedules available for certain years (1820, 1850, 1860, 1870, and 1880). These schedules enumerated manufacturing, mining, fisheries, mercantile, and other types of business. Information collected varies by year, but each schedule generally includes the name of the company or owner, the kind of business, capital invested, and the quantity and value of materials, labor, machinery and products. The first manufacturing census was taken in 1810, but only a few of the microfilmed schedules survived. You'll find them included with the population census schedules. The second was taken in 1820, but there are none for 1830. For 1840, only statistical information was recorded. Manufacturing censuses taken in 1850, 1860 and 1870 are called industry schedules, and include data on businesses with an annual gross product of $500 or more. While you won't find other employee's names on these schedules, they do offer a picture of what work life was like for your ancestor, whether he was a business owner or employee. Also, you may wish to peruse those available for the area where your ancestor lived for the business names, since your ancestor likely patronized some of them. Then, see if you can track down records for those businesses, which may include old account books listing an ancestor's purchases. Check the website of the National Archives and Records Administration (NARA) for tips on how to locate and search these and other special non-population schedules. Follow up by researching tax records, occupational records or company records, and applications for business licenses (availability and accessibility will vary depending on location and time period). Tip: Manufacturing/industry schedules for 1850 through 1880 are microfilmed with agricultural censuses for those years. You can also search them on Ancestry.com. City directories gained popularity in 19th-century North America and continued in many cities into the 21st century. Some eastern U.S. city directories date back to the 1700s. City directories capture the lives of bothfamous and ordinary people. Contents for city directories are compiled differently than many other historical records, and are gathered at frequent intervals (most often annually or semiannually). Also, appearance in these directories is not dictated by major events such as births, marriages, deaths, court actions or land transfers. Because directories were privately published and not compiled by government agencies, local inhabitants were often more willing to be included and contribute information. You can find city directories online at Ancestry.com, the or check the Online Historical Directories website and US CityDirectories.com. To find what directories might exist for the areas you're interested in, check the FamilySearch catalog and the Library of Congress. Also check with public libraries in that area. For more information on how to use city directories, be sure to read Sunny Morton's article "Directory Assistance: Discovering Ancestors in City Directories." Maps are essential tools for genealogists. The following types of maps are specifically useful for urban research. Find them at major libraries or through a Google search on locality and map type. Ward Maps. Use these maps in conjunction with city directories, especially in cases when a census index does not exist or when a suspected resident does not appear in an index. You can cut down on research time by defining the ward boundaries. Just remember to coordinate the ward map with the census year since ward boundaries changed frequently from one census enumeration to the next. An excellent resource is Michael H. Shelley's Ward Maps of United States Cities: A Selective Checklist of Pre-1900 Maps in the Library of Congress. The originals are housed in the Geography and Map Division of the Library of Congress in Washington, D.C. You can find them on microfiche in the Family History Library catalog . (Read the notes for ordering availability through your local Family History/FamilySearch Center). The Olin Library at Cornell University also has microfiche copies of the maps . In addition, some libraries have maps that are designed to facilitate searching cities in federal census years 1790 to 1930. Sanborn Maps. From 1867 to 1977, the Sanborn® Map Company of Pelham, New York, produced approximately six hundred thousand sheets of large-scale (usually 50 feet to the inch), detailed maps for over 12,000 American cities in order to assist fire insurance companies in setting rates and terms. The color-coded Sanborn maps depict the location, dimension, height, and use of buildings, as well as the materials employed in their construction, and other details and relevant features. Businesses appear by name. Individual residents do not appear on the maps by name, although specific addresses are shown. Genealogists can use these maps in combination with other tools such as census, directory, or utility files, to determine precisely what house or business the family lived and worked in. With a little work, it's possible to combine city directories and census entries with fire insurance maps and to locate each resident on the map. The Sanborn Fire Insurance Maps Online Checklist provides a searchable database of the fire insurance maps published by the Sanborn Map Company housed in the collections of the Geography and Map Division. The online checklist is based upon the Library's 1981 publication Fire Insurance Maps in the Library of Congress. The online checklist also contains links to existing digital images from the collection (keep checking back for additions and updates). The easiest way to locate other copies of the maps is to start with a Google search for "Sanborn insurance maps." Tip: There are many online collections from university libraries that offer free access to digitized copies of Sanborn Fire Insurance Maps for select states, cities, and towns. Since more recent maps are still protected by copyright, you may need to visit or contact the Library of Congress or other repositories holding Sanborn Maps for access. Panoramic Maps. The panoramic map was a popular cartographic form used to depict U.S. and Canadian cities and towns during the late nineteenth and early twentieth centuries. These beautifully artistic masterpieces are often also referred to as "Bird's Eye View" maps. Drawn in perspective, streets and buildings are depicted in them as if from the air. These commercially motivated drawings were commissioned by chambers of commerce, real estate companies, and businessmen whose establishments were frequently advertised on the borders. You can often find these in county and municipal histories. A useful guide is the Library of Congress's Panoramic Maps of Cities in the United States and Canada: A Checklist of Maps in the Collections of the Library of Congress, Geography and Map Division. For more information, see the overview page about the collection. The library has also placed a number of panoramic maps online. Libraries and historical societies in metropolitan areas may also maintain separate guides to their map collections. Maps may be cataloged by date, or listed by subject. Tip: Don't forget to look for school district and cemetery maps too. They could help you locate records from those agencies. Google Maps. Don't forget to search for cities using Google Maps and Google Earth. Google Street View within Google Maps is especially helpful for virtual tours city streets and neighborhoods. Municipal archives preserve unique information that can add rich context to your family history. They do not exist in every American city, but you can find them for places such as New York and Philadelphia, which has the oldest city archive in the United States, established in 1952. Check for records at the Borough level, too. Immigrant aid societies often helped new arrivals adjust to life in America. A good place to start for Immigrant Society research is at the FamilySearch catalog. Perform a keyword search on "Emigrant Societies." Ancestry.com subscribers or those with access via a library should check for special resources such as the New York Emigrant Savings Bank, 1850-1883. Remember also to check public and college/university libraries. In addition, look for information on Settlement Houses. These institutions served a grass-roots clientele in urban areas. One of the best known is Chicago's Hull House. Tip: Lubomyr Wynar's Encyclopedic Directory of Ethnic Organizations in the United States, was the first comprehensive guide to major organizations created by various communities. Check WorldCat to find a copy in a library near you or one available through Interlibrary Loan. The above are just a few suggestions to jumpstart your search for your city-dwelling ancestors. For even more resources, consult "Sources for Urban Research," viewable for free on the Ancestry.com Wiki, .